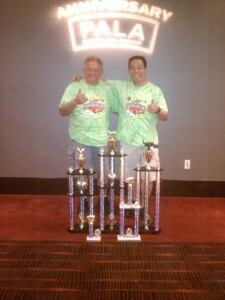 We won our second Reserve Championship for 2011 at the 1st Annual Pala Casino Buffalo Ranch BBQ contest in Pala, CA. There were 38 teams and we finished 2nd Brisket, 3rd Chicken, 4th Pork, and 8th Ribs. Congrats to Brazen BBQ for winning GC. John and Brad are smokin hot and have won their 2nd GC for 2011. Our new recipes for 2011 appear to be working albeit still somewhat of a hit or miss consistency. We continue to make notes of what the judges liked and what they didn’t and plan to keep refining and improving our recipes this year. 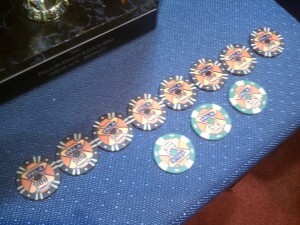 First time ever that our contest winnings were paid in casino chips! The Kids Q on Friday evening was fun to watch as there was enormous talent on show! These are the next generation pitmasters and it was good to see such passion and enthusiasm in their cheeseburger creations. I had to pleasure to meet John Belcher and his wonderful family. They have been on the road the past year touring the country in the RV while being featured on a reality TV show. 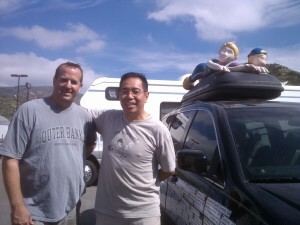 Their website chronicles their journey of 22,000 plus miles through 43 states and 6 Canadian provinces so far. Their goal is to hit all 50 states before returning home! Here’s their blog. Many thanks to Henry for organizing this event, KCBS officials, judges, and helpers! PS. Check out our new fashion trend setting SYD team shirts. We predict that tie dye and florescent colors will be the rage in 3-6 months. Remember you saw it here first!